Get directions to the Winthrop Fish Hatchery. Once there input your cabin address. DO NOT turn onto Wolf Song Road. Continue until you see the Wolfridge Sign and log arch. Follow signs toward the Winthrop Fish Hatchery. 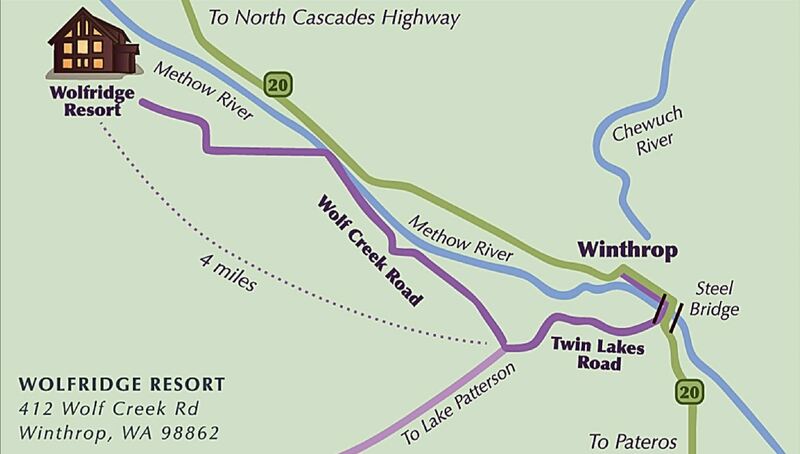 At south end of steel bridge over the Methow River, turn off Highway 20 toward the Winthrop Fish Hatchery. Follow Twin Lakes Road for approximately 1.5 miles (you will pass the fish hatchery). Turn right onto Wolf Creek Road. Go approximately four miles on Wolf Creek Road (staying on the paved road). Your key will be in a lock box at your cabin door. The code will be provided to you. If you need assistance while at Wolfridge, please call Gabrielle at 509 630 8198. Driving time from Seattle over the North Cascades (Hwy 20) or Stevens Pass (US-2) is about 4.5 hours. Hwy 20 is closed during the winter. Please check pass conditions on the web at WSDOT.gov or call 800-695-ROAD for current pass conditions. Note: We cannot be responsible for winter weather conditions. If you will be arriving during the winter, please be sure to carry proper equipment for driving in the snow. There are no refunds for road closures, however, if both Stevens & Snoqualmie passes are closed for eight or more hours, we will not charge you for that day. We do expect arrival on the following day.